Deforestation is responsible for 20% of the global emissions that are contributing to climate change. But it’s also taking a grave toll on the communities living in or near these forest communities.The forests of Ghana are disappearing, leading to the loss of biodiversity and fertile soils. Rainfalls are more erratic, streams are drying up and poverty is deepening throughout the region. 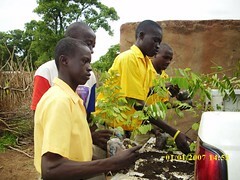 This project is introducing alternative livelihood programs to unemployed youth and women; establishing woodlots of about 10 acres each in every project community; reducing bushfires by 50%; and regenerating 30% of the forest cover in degraded areas and generally promoting awareness and education about the need to conserve forest resources. 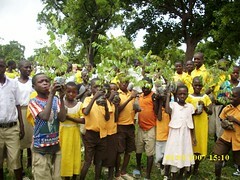 The Evangelical Presbyterian Church in Ghana has identified numerous partners for this project. The church has plans to collaborate with Specialists from Ghana Wildlife Division (GWD), Environmental Protection Agency (EPA), Forest Services Division (FSD), Ghana National Fire Service (GNFS), and Ministry of Food and Agriculture (MOFA) at Regional and District levels. This project will be implemented by the church’s agricultural stations in the selected project areas. These agricultural stations are managed by program officers and other technical staff that also include WID (Women in Development) Officers. Two of the project communities are situated in Northern Ghana, where poverty is endemic and 70% of the population is classified as poor. 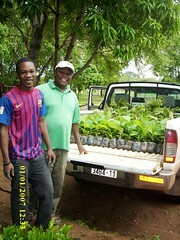 This innovative project not only restores forests but also improves the livelihoods of the local people. It includes plans for skills training in various sustainable livelihoods: snail farming, bee keeping, mushroom farming, and grasscutter rearing. Communities will also be surveyed to identify other possible livelihood training needs. In addition, business skills will be taught. The National Board for Small Scale Industries (NBSSI) will hold a two-day entrepreneurial workshop on marketing, accounting, records and book keeping, and training on micro credit and sourcing for funds will be organized for beneficiaries. 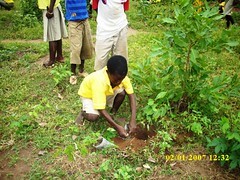 This project will transform degraded forestlands while improving the local economy and the community’s quality of life.